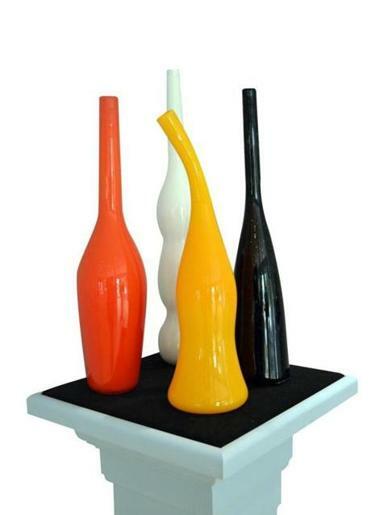 The Hot Glass Art Center features hand-blown glass pieces by local artists. HARRISVILLE, N.H. — We were driving the back roads that weave through the southwestern corner of New Hampshire, in the shadows of Mount Monadnock. Thick forests, pristine lakes, and trickling streams bordered the twisty, rural path. We passed by farms and orchards and honor-system veggie stands, on our way to the tiny town of Harrisville. Our destination was an 18th century farmhouse, home to artist Steve Barlow’s Shaker Style furniture shop and gallery. Barlow is a Master Craftsman and third generation woodworker. Unfortunately, when we got there, the shop was closed. (Should have called ahead!) But the scenery was beautiful, and we had a long list of other artists to visit in the area. We were on a DIY art tour of the region, long known as a creative hub. During the late 19th to mid-20th century, Abbott Thayer, Rockwell Kent, Frank Benson, Richard Merryman, and other well-known artists gathered here, drawing inspiration from the surrounding natural beauty. Today, hundreds of artists have followed in their footsteps, creating a vibrant art community among the small towns surrounding Mount Monadnock. We started in Keene, with a visit to the Thorne Sagendorph Art Gallery at Keene State College (229 Main St., Keene, 603-358-2720, www.keene.edu/tsag), a popular meeting place for the local art community. Rotating works of regional and international artists are exhibited in two, bright, sky-lit halls. One of the current exhibits, the Seattle-Havana-Tehran Poster Show (shown through Dec. 4), was particularly intriguing. Affectionately known by its creators as the SHT Show, it includes more than 60 contemporary posters, shown in groups of three — one from each city. The groups share something in common, either colors, shapes or subject matter. Despite the fact that the artists come from different geographic and political areas, they share stunning design similarities. Taken as a whole, the exhibit is wildly colorful, eye candy. We left the busy, student-packed downtown area and headed to the disarmingly sweet, step-back-in-time village of Walpole, with a picturesque town green, white steeple church and pretty Colonial and Greek Revival homes. The LA Burdick chocolate and pastry shop and French-style bistro is also located here. But, we’d come to check out the Walpole Artisans Cooperative (52 Main St., Walpole, 603-756-3020, www.woodcollection.com/WalpoleArtisansCooperative.htm). The co-op is managed by 20 or so local artists who exhibit and sell their works, including fabrics, glass, woodworking, paintings, jewelry, and photos. We picked up a few small gifts, including a whimsical, hand-carved, hand-painted wooden back scratcher by artist Philip Morgan, shaped like a bird’s head. We also popped into the Cynthia-Reeves @ The Barn (28 Main St., Walpole, 603-756-4160, www.cynthia-reeves.com), located just down the street, for a look at contemporary artist Shen Chen’s abstract paintings (shown through Oct. 22). The small gallery hosts 12 or more curated exhibitions a year by established international artists. Good Hot Fun. That’s what the chalkboard sign said in front of the Hot Glass Art Center (99 Main St., Marlborough, 603-876-9474, www.hotglassartcenter.com), our next stop. If we’d had the time, we might have created our own piece of glass. Instead, we watched a glassblower at work, and browsed the gallery with hand-blown pieces by local artists. We traveled through Dublin, home to Yankee Magazine, down curvy country roads, straddling a series of lakes and ponds, through Harrisville and on to the tiny town of Hancock. Home for the night was the historic Hancock Inn (33 Main St., Hancock, 603-525-3318, www.hancockinn.com, rooms start at $159), the oldest inn in New Hampshire, with roots dating back to 1789. There’s a large, original Rufus Porter mural in one of the rooms and a Moses Eaton replica in another. (The artist’s homestead is located just down the street.) Art aside, any room here is comfy, furnished with lush linens and quality antiques, some with whirlpool baths and fireplaces. We grabbed drinks in the handsome Fox Tavern, with wood paneling and exposed ceiling beams. After breakfast at the inn the next morning (included in the rates), we stopped in Main Street Cheese (37 Main St., Hancock, 603-525-3300, www.mainstreetcheese.net) to purchase some of their artisan goat chevre. No one was around, but a sign instructed us to help ourselves, and leave the money on the table. Our last stop was Peterborough, where we visited the Mariposa Museum (26 Main St., Peterborough, 603-924-4555, www.mariposamuseum.org). Located in a former Baptist Church, the community museum is a hidden gem, full of artifacts and exhibits designed to promote a greater understanding of other cultures. There are more than 7,500 pieces of folk art from six continents in the permanent collection. Kids especially love the museum, where they can play musical instruments from around the world, maneuver folk art puppets, and try on traditional clothing. Another gem is the NHIA Sharon Arts Center Gallery (30 Grove St., Peterborough, 603-836-2585, www.nhia.edu/campus-life/sharon-arts-center), with two galleries of exhibits, showcasing the work of internationally known artists, as well as a store with arts and crafts produced by regional artists. The family-owned Sarah’s Hat Boxes (36 Grove St., Peterborough, 603-924-3802, www.sarahshatboxes.com), with a showroom filled with colorful, handmade boxes, and Peterboro Basket Co. (130 Grove St., 603-924-3861, www.peterborobasket.com), the oldest continuous manufacturer of baskets in the United States, are also located in Peterborough. We took a quick peek in both, then drove the slow road home, taking in the rolling, rural scenery, and keeping our eyes peeled for tucked-away galleries and studios, with their “Open” flags flying.